Abode Hospice aims to enhance the quality of life of people experiencing life-limiting illness. 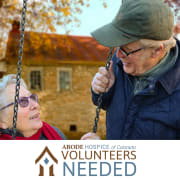 Our interdisciplinary approach to care involves volunteers from the community who form an integral part of the hospice care team. Volunteers can become involved in a number of ways with our patients. Companionship visits to our patients can involve playing cards, having a conversation, reading, assisting with life-narrative projects, providing respite for caregivers as well as other related activities. Join our team and make a meaningful difference to the lives of others!